In the last ten years, Batman has certainly won the "Mine’s bigger than yours" argument with fellow superhero, Superman. Batman Begins and The Dark Knight have easily overshadowed Superman’s recent effort, Superman Returns. In the live action world, even Iron Man, Thor and Captain America seem to be getting more press. Does this mean Superman is DOA? Certainly not. 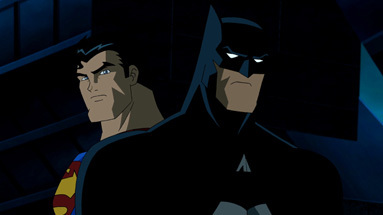 DC is instead focusing their "man of steel" efforts on the animation world, most recently in the action-packed film, Superman/Batman: Apocalypse. Let’s get one thing out of the way, this is not Batman’s movie. If you’re looking for a solid caped crusader vehicle, check out Batman: Under the Red Hood, a recent animated Batman film that far exceeded expectations. Unfortunately (or fortunately, depending on how you look at it) this film exists in Superman’s world. The movie is based on the "Supergirl from Krypton" storyline from the comics, and is a sequel, of sorts, to Superman/Batman: Public Enemies. More specifically, it introduces Supergirl and showcases her initial struggle with the dark side. Batman swoops in every now and again to doubt her intentions, but he is mostly around for DVD marketing purposes. The story is pretty straightforward, but I get the impression creators amped up the action sequences to appeal to the young male demographic who might not otherwise be interested in a female-centric story. Darkseid is the central villain, while Wonder Woman provides ample support to the male heroes. I mentioned the action. This movie is all action. The story is secondary to the fight sequences and explosions. So, does the animation stack up? I’d say, yes. The animated films have grown in popularity over recent years, so it would make sense that with each subsequent film, bigger budgets are allotted. It is clear that there are great animators involved as you can see greater detail in set pieces and special effects. Because this is also considered a sequel to Superman/Batman: Public Enemies, we get a familiar artistic style to the predecessor. It’s nice to see continuity among these animated films since there seems to be a new one every few months.